Nordic’s Impulse DP™ is another perfect model to begin (or continue) your hot tub lifestyle! 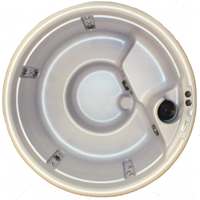 Still at a 78.5 inch diameter but at a 35 inch depth, the Impulse DP™ offers superior hot water therapy with seating for up to 5 people. The Impulse DP™ also offers barrier free bench seating where you can let tensions whirl away. If you live with fibromyalgia or arthritis, most health care providers recommend reducing stress and increasing circulation. What is better than your own hydrotherapy spa? Hand-crafted from the finest materials available, incorporating the same components found in spas costing three times as much, and offering Nordic’s dual-therapy system, the Impulse DP will envelop you in pleasure and relaxation..